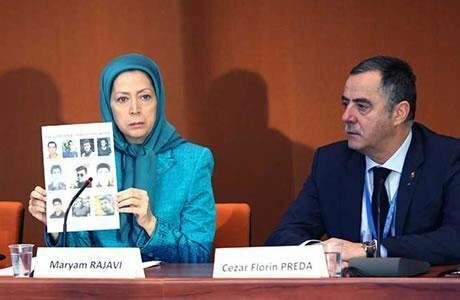 In a campaign to secure the release of those arrested in the course of the Iran uprising, the Iranian opposition leader Maryam Rajavi visited the Council of Europe in Strasbourg, on Wednesday, January 24, 2018, to urge the European governments to stand with the Iranian people and help secure the release of the prisoners of the uprising. At a press conference at the Parliamentary Assembly of the Council of Europe, Mrs. Maryam Rajavi declared the Iranian people and Resistance’s demands from Europe and the International Community in general, in the wake of the uprising which shook the Iranian regime to its foundations in the first two weeks of 2018. She urged Europe to end its silence and inaction. “The Iranian regime must understand it has to pay a heavy price for opening fire on demonstrators and killing them under torture,” she reiterated. She further noted that the Iranian regime is on its last leg. The situation in Iran will not return to the pre-uprising stage. The people of Iran will continue their struggle until the regime is overthrown. The Council of Europe, the European Union and its member states, and the United Nations must stand with the people of Iran and not the religious fascist regime. The NCRI President-elect urged the UN High Commissioner on Human Rights to launch an international delegation to investigate the deaths, detentions and disappearances and the murders in prisons. The NCRI President-elect Maryam Rajavi stressed that doing business with the Iranian regime fuels its killing machine and its export of war and terrorism to the Middle East since the economy is concentrated in the hands of Khamenei, the mullahs’ supreme leader, and his terrorist Revolutionary Guard Corps (IRGC). She therefore urged an end to all diplomatic and economic relations with the Iranian regime and comprehensive sanctions against the regime for decades of crimes against humanity.